First prizewinner of the International Commerzbank Chamber Music Award 2008 and recipient of the NORDMETALL Chamber Music Award at the Mecklenburg Vorpommern Festival 2009, The Sitkovetsky Trio is a collaboration between three young musicians who share a passion for Chamber Music. Having met and worked together at the Yehudi Menuhin School, they founded the trio in 2007 and it has emerged as one of the outstanding trios of today, receiving numerous awards and critical acclaim. It has won the Philharmonia-Martin Chamber Music Award, the Kirckman Society Award, the Tillett Trust, and is supported by the Hattori Foundation, the Fidelio Trust, the Music Benevolent Fund and the Swiss Global Artistic Foundation. It held the Junior Fellowship at the Royal Academy of Music 2007-08 and in 2008-09, the trio became the first recipients of the Golubovich Fellowship at the Trinity college of Music resulting in many performances across London. For 2009-10, the trio continued its residence at the Trinity, this time having received the Richard Cairnes Junior Fellowship for Chamber Music. Last year, the trio made a highly successful Southbank debut, playing a recital in the Purcell Room, and was invited to play in front of Her Majesty The Queen in London. It made its debut appearance at the Wigmore Hall in November 2008 and another recital there in May, 2009. 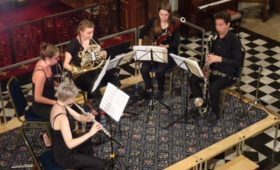 It has already been invited to give Recitals at various Festivals throughout the UK and abroad, in venues such as King’s Lynn, Brighton, St George’s Bristol, the Alte Oper in Frankfurt, the Mecklenburg Vorpommern Festival, the Bath Mozartfest, the Chamber Hall of the Concertgebotsuw in Amsterdam and the Palais des Beaux Arts in Brussels. 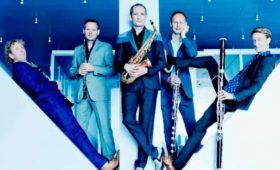 It also performed the Beethoven Triple on tour with the Orchestra of the Swan and the Munich Symphoniker in November 2009. 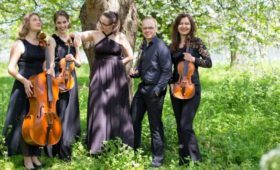 All three musicians enjoy varied careers as soloists and chamber musicians in their own right.